PCB conformal coating is a painting with lots of properties including anti-mildew, anti-moisture, anti-dust, anti-heat, anti-cold shock, anti-aging, anti-salt spray, anit-vibration, etc. 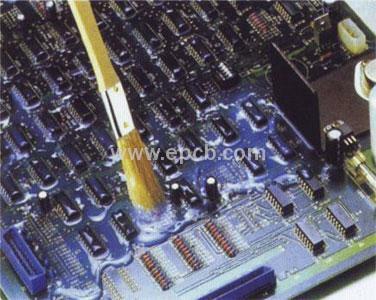 Three anti-conformal coating is the industry's most commonly used coating methods. PCB boards used three anti-conformal coating will form a layer of three anti-protective film on the board surface, so as to ensure the safety and reliability of the circuit board. Under terrible conditions, such as the chemical environment (fuel, coolant, etc. ), vibration, dust, salt spray, humidity and high temperature, printed circuit boards may produce corrosion, softening, deformation, mildew and other issues, leading to circuit board circuit failure. Three anti-conformal coating on the surface of the circuit board will form a light and flexible film with about 25-50 microns thickness. It protects the circuit against the harsh conditions described above. 1.All coating operations should be carried out at the temperature not lower than 20 ℃. Printed circuit board as a composite material will absorb moisture. such as not to tide, three anti-conformal coating can not play a full protection role if the moisture still exists(pre-dry, air-dry can remove most of the moisture). 2.Coating thickness: coating thickness is between 0.05mm-0.15mm. Dry film thickness is between 25um-40um. 3.Coating dry: After coating, it takes 20-30 minutes to dry by air (40 ℃), make the coating dry, and dry it before carrying out product rotation. 4.Coating curing: 8-16 hours at room temperature. 5.Secondary coating: In order to ensure the thickness of the product required for high protection, the secondary coating may be applied after the coating is cured (it is determined whether the secondary coating is required or not).